Nowadays, there are a plethora of ways to get drums into your music. From regular samples and loops, through dedicated sample construction kits, not to mention the various incredible software packages that allow the manipulation of MIDI or REX based loops, you’d be forgiven for thinking that no-one really needs drummers anymore…..
Real Drummers will almost always make your track sound better. Feel , Groove, ‘Human Quality’, Dynamics, these are all things the computer programmes try to achieve, yet hours and hours of programming time are wasted, when all that’s needed is a real drummer. The Downside? Drumkits are big, loud and cumbersome. Oh, and did I mention Loud. Well, first things first. You do need a room that’s big enough to hold a full kit, plus room to mic it up, and preferably space for the sound to move around. If the room’s too small, your recording will bounce straight back off the walls and your recording will sound boxy and small. The bigger the room the better, in terms of room mics. These are mics that will capture the sense of space around the kit. Also, you really do need to be in a different room to monitor the sound properly. 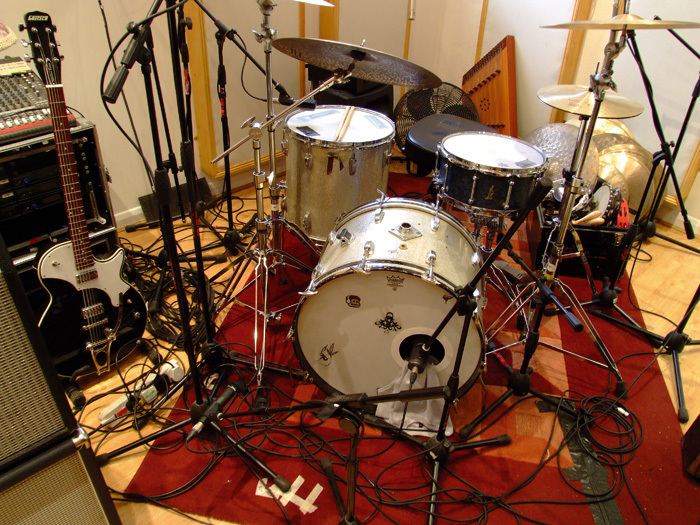 Seriously, Drum kits are noisy bits of hardware, that are constantly being hit and thumped, and consequently, bits rattle and jangle and these will seriously mess up your recording. You’re gonna need, spanners, and drum lugs, gaffer tape and tissues, anything to stop the extraneous noise. Also, if you can afford it, new drum heads ALWAYS sound better than old. So replace them if you can. Make sure the drums are tuned. Again there a million articles about this, but fundamentally, the drummer should be happy with the sound of his kit, before you start to record. Do the Kick and Snare sound good together? Are the Toms tuned to descend in the right increments? All this preparation will pay off when you start to record. Promise. It is possible to record a drum kit with just a couple of microphones, but in truth the best way is to try and mic up everything. If that’s not possible, then at least try to find 4 mics for the kit , and a couple of overheads for the room. I won’t go into which mic’s are best for what in this piece. Suffice to say, there are many different mics available which manufacturers will specify for different jobs, and this info is ALL over the internet. Whichever mic you choose, place it halfway inside the Bass Drum Shell, at a slight angle and pointing at the spot where the foot beater strikes the skin. If you then boost the eq around 60hz and cut it slightly around 150 hz, you should get a nice Bass Drum Sound without too much midrange wash. Probably the most important drum in the mix, the snare is the one which usually gets ‘messed’ with the most. To capture a good signal, place the mic horizontal with the top of the snare with the head of the mic just over the rim of the snare drum. You can mess around with the eq around 10 khz to give it some ‘crack’, but as I say, experiment to get the sound you’re looking for. Sometimes, enough of the signal from the Hi-Hat will bleed into the snare mic, to give you a pretty good sound, but if you do decide to mic the hats, try and use a condenser mic with a cardioid pattern, and try to point the mic away from the snare, aiming half way across the top of the top cymbal. Eq-wise, take out some bottom end, and then experiment with upper ranges to get a crisp sound. The best way to get a good Tom sound is to aim at the centre of the Tom skin, WITHOUT getting in the drummers way! The idea is to have all the toms sound like the same drum, but tuned differently, rather than sounding like 3 or 4 separate and different instruments. Again, use condensers with a cardioids pattern, and aim to set these up around 4 feet apart, and point them to the left and right of the kit. Once all your mics are in place, have the drummer play the kit at the level he will be playing during the recording. I say this because, it’s important that you don’t set up all the levels ready to record, only to find that when the track kicks in, the drummer starts to play twice as hard as he did during set up. How do the Kick and Snare sound together. Can you hear the Cymbals clearly? Are the Toms the right way round?? Finally, if you’ve followed all the above, you should be getting a decent set of signals into your machine. Experiment is the answer to getting a good sound, and you should allow yourself at least half an hour to get a good mix. Also, many Bass players and drummers find it better to record at the same time.